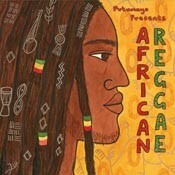 Tracks from Cote d’Ivoire, Cape Verde, South Africa, Ghana, Burkina Faso, Nigeria and Guinea-Bissau. Ba Cissoko with Tiken Jah Fakoly give us the sweet melodic side of reggae with ‘On Veut Se Marier’ while Majek Fashek’s ‘Man Of Sorrow’ has a real feel of Marley. Very good.